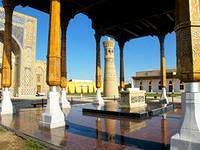 Bukhara is the city where many thinkers, scientists, theologians, and poets lived. One of them is Abu Ali ibn Sina (Avicenna). He is the author of many interesting works in the field of medicine, psychology, mathematics, logic, physics, music, poetry, zoology. "Canon of Medicine" is his greatest creation. Al-Hasan al-Basri is theorist, psychologist, who preached the selfless love of God. It was his distinguishing feature of Sufi ideology. 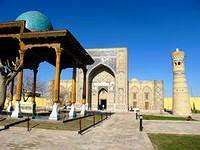 There are seven sacred Sufies in Bukhara. 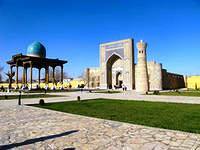 As a rule the tour starts from the grave ofSheikh Abdul-Khaliq Abd Al Gijduvani, who founded School of the Central Asian Sufism. He always took a view that every imam must have his own job. There is Ulugbek madrasah near the new mosque, where pilgrims can pray. Muhammad Arif Ar Revgary began to learn Sufizm very early. When he was 19, he taught philosophy. His manuscript "Nafahat ul-uns" and "Arifnoma" are the only written evidences about the life of the famous Sufi. Having read his works, it is clear that Haja Arif Revgary was one of the most worthy successor of traditions and practices “Hadzhagana” . Hoja Mahmud Anzhir Fagnavy was a famous Sufi of his time. He was engaged in gardening. Fagnavy was the spiritual successor of Sufi tradition. He was an expert at his job carpenter thereby earning his living. There is a beautiful mausoleum not far from the grave, as well as a mosque and a well with holy water. It is very popular place with pilgrims where they can pray. One of the most famous spiritual leaders is Hoja Azizona (Ali Romitani). He is also known as Azizon (Honourable Sheikh). He was born in 1195 in Kurgan and worked as weaver. Thanks to him, the Mongol khans accepted Islam, believing that they are miracle-worker. The next road leads to the tomb of the great Sufi al Bobo Samosi, who predicted the birth of Bahauddin Naqshbandi. Bobo al Samosi said: “It will take quite some time, and his fragrance will spread all over the world”. Today the tomb of St. Babai Simasi is a place of worship for hundreds of thousands Muslims from all over the world . Mausoleum Said Amir al Kupol is located in the village Suhor. The building is a mosque, mausoleum and flower garden. “Kupol” means “Potter” as he was an expert at this craft. The tour is finished by the visiting of Bahauddin Naqshbandi mausoleum, whose birth was predicted by Bobo Samosi. Naqshbandi was born in 1318 in the villageHinduvan. As a spiritual teacher, he was a supporter of austerity. He said that the Sufi had to make a living exclusively by work. Bahauddin owned several professions: weaver, potter and carver in wood. Many tramps followed his example, and thanks to him, they began to earn a living by craft. Today, there is the majestic mausoleum here. This place is still visited by thousands of pilgrims. According to legend, if you touch the memorial three times, a visit of the holy place is equal to “hajj” to Mecca.